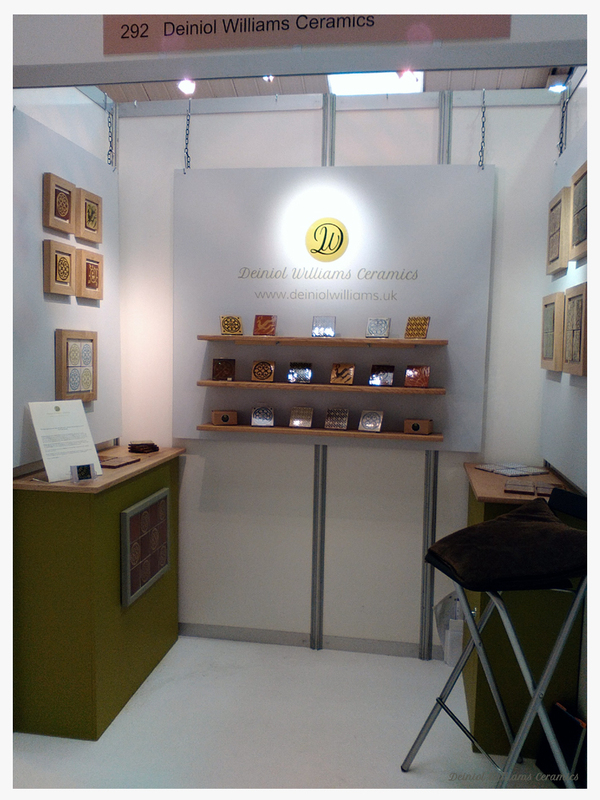 I decided early last year to have a go at doing a trade show and thought that the BCTF in Harrogate was a good one to do. It's not too far to travel, not the most expensive one (definitely a deciding factor at this stage), and is very well established and attended. I knew there would be a lot of work involved but it was definitely worth it for meeting new gallery / shop owners and reinforcing relationships with current stockists. Also, the idea of selling work wholesale directly to shops was rather appealing. It would free up a bit of my time from doing retail shows and fairs and let me concentrate on making my tiles. Just over 3 months until the fair. Panic. What do I need to do?! Design a stand. So, for a while I worked on designing a neat little stand that would fold up for easy transport but more importantly it would show the work off to it's best. I had done a bit of research and it seems that you really need to catch the eye of passing customers. I had 2m in which to make their head turn and pop over to take a closer look. After the design phase, I turned my concentration on developing and finishing my range of brand new designs and products ready for the BCTF. Also, I needed to get all the paperwork sorted, and there was a lot in my case. It was now early April (2 weeks to go until the show) and I needed to build the stand. I begun by going down to my local independent DIY and Timber Merchants and collecting everything I needed. Cue lots of sawing, drilling, hammering, and finally painting. It took a long time, but then again I'm somewhat a perfectionist! It was finally here, April 11th, the day before the show opens. I turned up to find my space all empty and pristine, with my name displayed above 'Deiniol Williams Ceramics'. This was all very real now. I quickly set about getting the stand built and realised that it would take far longer than I had anticipated. Luckily I had a great deal of help (including moral support) from my girlfriend! After getting the stand built, it was time to face the music and dance. I won't lie - I was rather nervous to say the least and wondering what on earth I was letting myself into and if there was some way of escaping! However, after a few hours I began to realise that it wasn't anywhere near as threatening as I had built it up to be - I chatted to gallery owners and to my fellow makers and it turned out that I began to really enjoy the experience. I made some great connections, met some interesting makers, and gained some very valuable insight into working with galleries. Being that it was my first time at the BCTF, galleries and shops are slightly wary of ordering off a new maker, so it transpires you need to do these shows for a few years to gain their trust. My fellow makers imparted a lot of information as they were seasoned trade show participants. I'm now glad I made plenty of notes as I never would have remembered everything. I will definitely be doing it again next year, however I'll be a lot more prepared and have a better understanding of what I need to do - give myself plenty of time for starters!